To keep your teeth for a lifetime, you must remove the plaque from your teeth and gums every day with proper brushing and flossing. Regular dental visits are also important. Daily cleaning will help keep calculus or tartar formation to a minimum, but it won’t completely prevent it. A professional cleaning at least twice a year is necessary to remove calculus from places your toothbrush and floss may have missed. Gum Disease is swelling or soreness of the gums (the soft tissue) around your teeth. It is caused by the bacteria in plaque, a sticky, colorless film that forms on your teeth. The plaque bacteria have toxins that inflame gums. If you do not remove plaque by brushing and flossing your teeth, it can build up and infect your teeth and the bone that supports them. If not treated by a dentist, you can lose your teeth. The signs of gum disease are not always easy to see and can be painless. The earlier gum disease is caught, the easier it is to treat. That is why it’s important to see your dentist regularly. This is the first stage of gum disease. Your gums may feel tender and you may see some bleeding when you brush or floss. The American Academy of Periodontology considers gingivitis a mild periodontal disease. Gingivitis can be reversed by having a dentist or hygienist clean your teeth and with proper brushing and flossing at home. At this stage, plaque spreads to your tooth causing an infection, which damages the bone and fibers that hold teeth in place. Your gums may begin to pull away from your teeth. Proper dental care and better home care can help stop more damage. In this final stage of gum disease, the fibers and bone holding your teeth in placed are destroyed. This can cause your teeth to shift or loosen and can affect your bite. If treatment can’t save your teeth, they may need to be removed. This procedure is otherwise known as conventional periodontal therapy, non-surgical periodontal therapy, or deep cleaning. It is a process of removing or eliminating the etiologic agents – dental plaque, its products, and calculus – which cause inflammation. It is performed under local anesthesia to reduce discomfort. Using an instrument called an ultrasonic cleaner and scalers, plaque and calculus that are buried deep at the bottom of each periodontal pocket are carefully removed. The tooth’s root surfaces are then smoothed or planed. 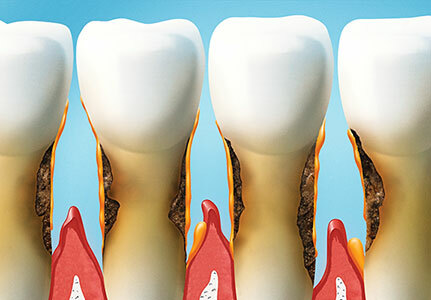 If deep periodontal pockets do not heal well after scaling and root planning, periodontal surgery may be needed to reduce the pocket depth and make teeth easier to keep clean. Surgery allows us to access hard to reach areas that require the removal of tartar and plaque. The infected tissue below and between the teeth is removed, it is then followed with tooth scaling and root planing. The gums are then sutured back into a new position to improve the health of the tissue around the tooth.